Turkey burgers have been a favorite of mine for quite some time since I grew up with a mom who made them for me! Another quick, easy meal my husband and I are big fans of. Chop and dice the onion, cheddar cheese, pepper, garlic and cilantro. Pre-heat a large nonstick skillet, indoor grill pan or tabletop grill to medium-high heat. Combine the ground turkey, onion, cheddar cheese, chili powder, ground cumin, jalapeño or serrano pepper, garlic, salt and pepper in a medium size bowl and mix everything together with your hands. Score the meat with the side of your hand to separate into four equal amounts. 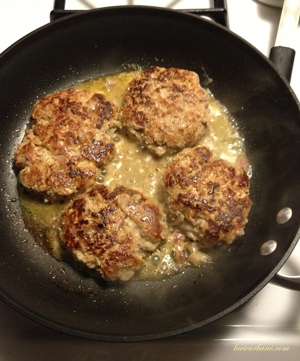 Form the mixture into four large patties no more than one inch thick. Drizzle a bit of olive oil on the patties and place them in a hot pan with a spatula and cook for 5-6 minutes on each side, or until the turkey is cooked through. *Optional* For the cilantro cream, combine the sour cream and chopped cilantro, salt and pepper in a small bowl. Serve the Cheddar-Studded Turkey Burgers topped with a little of the cilantro cream if you’d like!